Enjoy powerful, dynamic audio with the LG CJ88 XBOOM 2900W Bluetooth Wireless Music System. 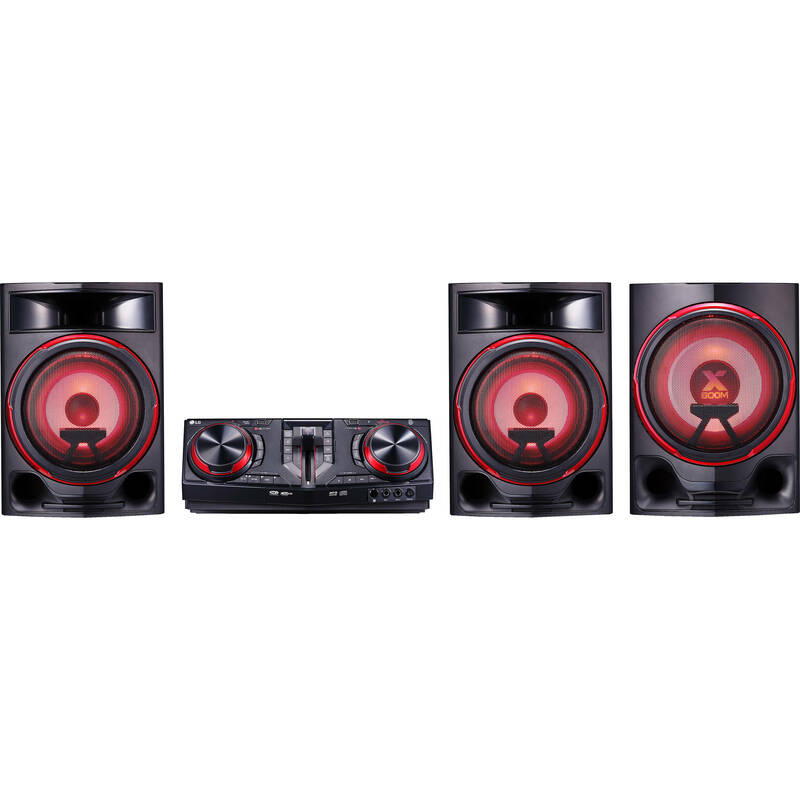 It delivers up to 2350W of total power from its two 2-way speakers plus 550W from its subwoofer. Each speaker has a 1" tweeter and an 8" woofer, and the subwoofer has a 10" driver for enhanced bass reproduction. Bluetooth is built-in for wireless music streaming from compatible devices like smartphones and tablets. The CJ88 has two USB ports that support audio playback from compatible USB drives. The RCA input allows you to connect a more traditional audio source, and the integrated AM/FM tuner allows you to enjoy free over-the-air radio programming. The built-in CD player supports MP3- and WMA-encoded CDs. In addition to its 2350W main speaker total output, the CJ88 pumps out powerful bass from its 550W subwoofer. The Party Accelerator controller helps you adjust the audio and light settings. The Karaoke Creator is designed to suppress the vocals in a song, making nearly any track ready to play behind a new singer. It can also change the key of the song to better suit the voice of the singer. In order to perform karaoke, a microphone is required. In order to support a variety of source types, the CJ88 has RCA, 1/8", and two USB ports that support playback from external drives. The lighting of the speakers is synchronized to the beat of the music to help create an enhanced party atmosphere. The CJ88 features voice filters to augment karaoke singers. There are bass, soprano, helium, robot, duet man, and duet woman effects, and each has two separate echo effects for a total of 18 different sounds. Wirelessly stream from your compatible device via Bluetooth for a virtually seamless listening experience. Up to three different people can connect their devices to the system via Bluetooth and build a playlist on the fly without interrupting the party. They can each pick a song to add to the queue. The mica-sprayed subwoofer driver is designed to reflect the surrounding lights to help create an eye-catching experience.